This jute bottle bag fits a bottle of upto 1.5 litres. 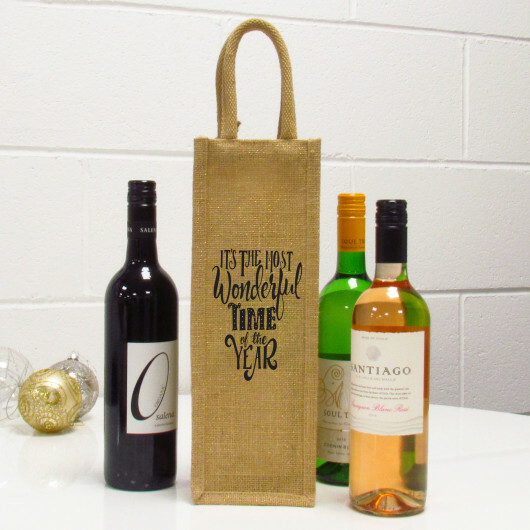 The jute features a gold shimmer thread detail throughout adding that extra bit of sparkle we all need at Christmas. The design features a black design with the wording 'It's The Most Wonderful Time Of The Year' classic Christmas quote. We also give you the option to add a bottle of wine to your order to be included as part of the gift, you can choose from Red, White or Rose each bottle is hand selected.